Doorsteps Gourmet Sandwiches. With a fleet of 20 (and growing) custom refrigerated delivery vehicles delivered by our friendly, informative and polite staff you can be assured that your order will arrive fresh and ready to enjoy every day. Have you got Google Earth on your computer? If so, then download the Google Earth Map of Doorsteps Lisburn Road. Is this the wrong position for Doorsteps Lisburn Road? If you think so, then modify its position. My husband and myself where at doorsteps today for lunch. He ordered a chiken wrap with coleslaw, salad and chips, i ordered a portion of chips with pepper sauce. Firstly the only free table had not been cleared which had yet to be cleared but was fair enough as the place was busy. The girl came to clear the table and wiped the debris onto the floor. After an age our food came. Overcooked cold chips and a crispy burnt wrap. I went to the counter with my food and explained the chips were cold.they brought them back a few minutes later amd asked me to taste if they were warm enough.they were microwaved as there was my half eaten chip on the plate. We had already paid when we placed our order otherwise i would have complained. To be fair the sandwiches look great but i won't be back to try them. 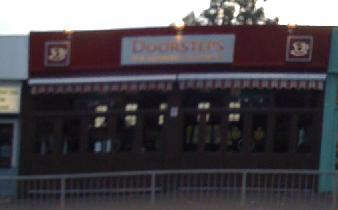 I decided to try doorsteps for lunch and was sorely disappointed. Firstly, there were not enough seats inside so we had to sit outside - I could deal with that. I ordered a tea and it arrived with the teabag still in the cup and no spoon to retrieve it with - was I to use my fingers? When I went inside to ask for a spoon I was handed a plastic spoon which was dirty. I managed to find a table inside at this point. I had to clear my own table and it was filthy- no sign of anyone coming to wipe it but as it was raining outside I thought I would make do. My sandwich finally arrived on a strangly wet plate and no knife or fork to eat my salad with. When we finally received cutlery it was thrown at us without a backwards glance, as our meal had been. To top the whole experience off, a waitress walked past and lifted the milk off my table without so much as a "Are you finished with that?". Needless to say I am not impressed. I won't be returning to doorsteps even if I was paid. A very disappointing lunch.